This poor patient came to emergency department today in the morning. He is a 57 years old male patient, known case of Diabetes Mellitus, and also end stage renal failure on regular dialysis. History of accidentally knocked a hole on his left foot 3 days ago, then noted there’s maggots in his leg and came to seek help. OMG!!!!! The worst wound I’ve ever seen!!! Again I warned that do not proceed if you are not ready! 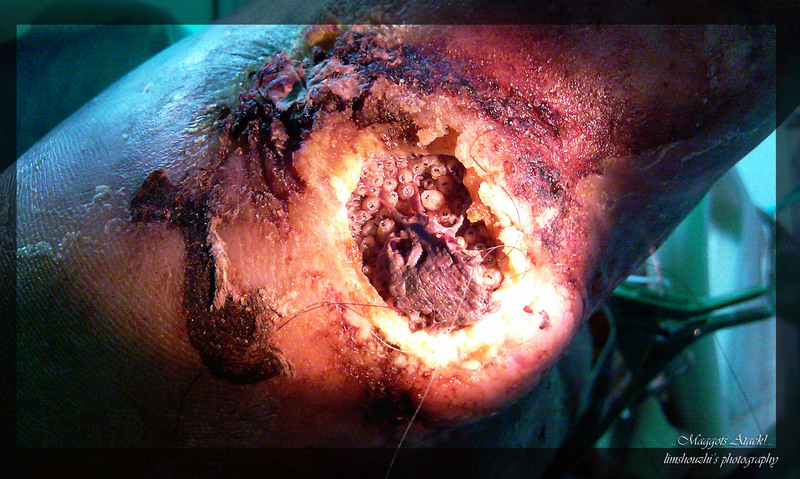 This picture shows the initial leg of the patient, from far you can see there’s a wound over his plantar surface of the foot. 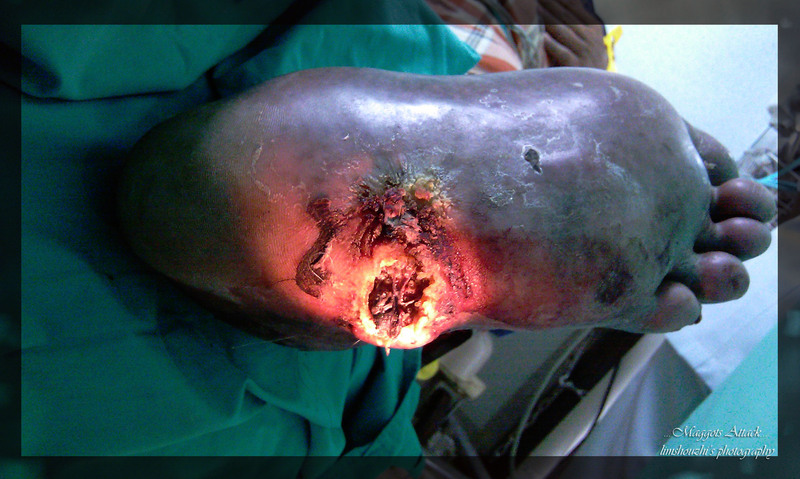 He got diabetes, and this is diabetic foot ulcer! And what is the grade? 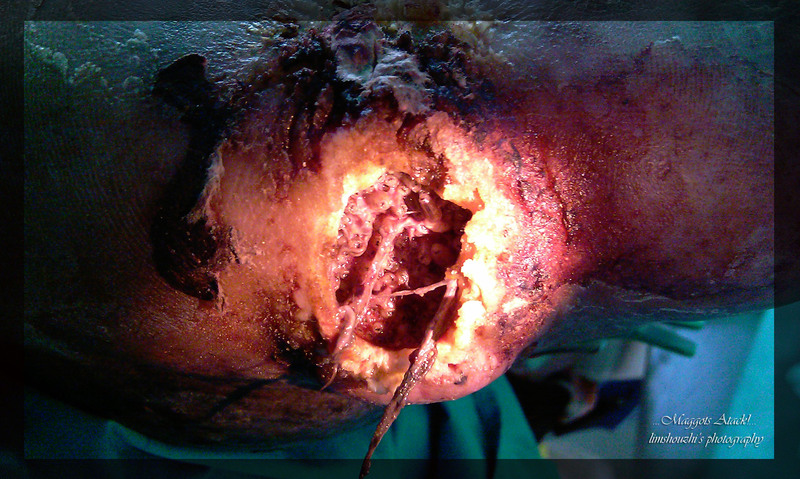 A closer view of patient’s foot, yes, we can see there are few maggots lingering at the wound… Please, if you able to proceed to this picture, please take care of yourself and your family members who is having diabetes, because the following pictures I will show you how bad is it the actual wound of this patient if we are not taking good care of our diabetes! Yes! This is how bad it is! From this picture you can see the maggots are uncountable! Some more they are already matured! Go to the last picture with macro! This is the closest look I can get for you! Disgusting? 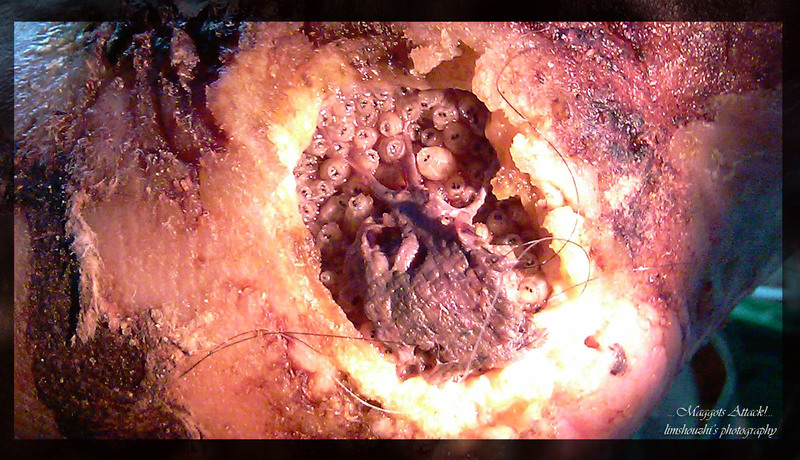 How long this patient keep the breeding base for this maggots was unsure, and he is still consider lucky that the accident lead him to notice his actual foot problem!And can you imagine how is the smell of this wound! These pictures taken from a life patient, and not from the corpse, and please get an idea how miserable a diabetes can cause to a patient if not taken good enough! Gallery | This entry was posted in Life, Little Medical Knowledge. Bookmark the permalink.